Boycotts against Israel solve nothing, the president of the European Parliament said on Tuesday. “There is no boycott. 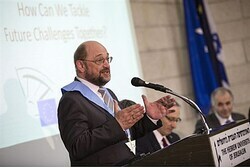 In the European Parliament there is for sure not a majority for a potential boycott,” said Schultz, when asked about the boycott by the audience. “There is a debate if some of the products produced in occupied territories of settlements could have access to the European Union market in compatibility with European Union rules, and this is an open debate. My personal view is that a boycott is not a solution for anything. And therefore as president of the European Parliament I was strongly in favor, for example, of upgrading of the scientific cooperation between the European Union and Israel,” he added. The comments come months after the European Union (EU) published new guidelines which boycott Israeli entities operating beyond the 1949 Armistice Lines. The EU has been pushing both Israel and the Palestinian Authority (PA) to reach a peace agreement and has slammed planned Israeli construction in Judea, Samaria and eastern Jerusalem. Last week, EU Foreign Affairs Commissioner Catherine Ashton demanded Israel take back its announced plans to build over 700 housing units in its capital city. Also last week, the EU Ambassador to Israel, Lars Faaborg-Andersen, threatened Israel with “increased isolation” should peace talks fail. They have said: ‘Come, and let us cut them off from being a nation; that the name of Israel may be no more in remembrance.